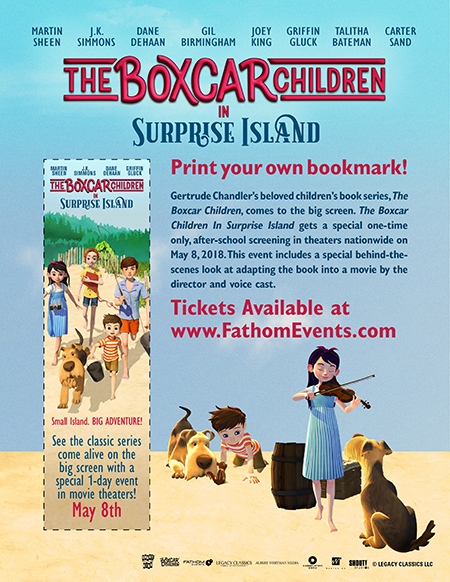 A new animated feature The Boxcar Children – Surprise Island, opening in theaters nationwide on May 8 as part of a special after-school event with Fathom. The film is based on one of the books from the beloved series by Gertrude Chandler Warner and is family-friendly for all ages, with a recommendation for kids 3-13. With hundreds of theaters across the nation booked, there will likely be a theater near you offering up the film. This theatrical event is US-only. 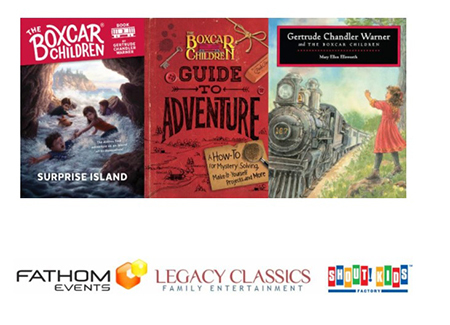 The beloved Boxcar Children are headed to the silver screen! 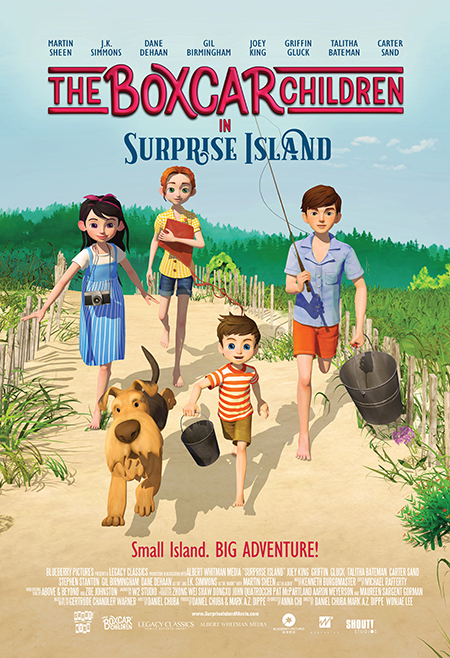 The new animated feature film THE BOXCAR CHILDREN - SURPRISE ISLAND hits theaters nationwide for a special one-day event on May 8. This exciting after-school event is a partnership between Fathom Events, Shout! Kids, and Legacy Classics, and it will also offer moviegoers an exclusive introduction with actor Griffin Gluck and Director Dan Chuba explaining the process of adapting the book to film, and the process of animating. Moviegoers will be able to enjoy the film in approximately 700 select U.S. movie theaters. A complete list of theater locations will be available at Fathomevents.com. Tickets for THE BOXCAR CHILDREN - SURPRISE ISLAND will go on sale Friday, April 6, and can be purchased online or at participating theater box offices. THE BOXCAR CHILDREN - SURPRISE ISLAND, the highly-anticipated movie adaption of the popular children’s book of the same name, stars Golden Globe®-winning actor Martin Sheen (The West Wing) as James Alden, Oscar®-winner J.K. Simmons (Whiplash) as Dr. Moore, Dane DeHaan (Valerian and the City of a Thousand Planets) as the mysterious Joe, Joey King (Independence Day: Resurgence) as Jesse Alden, Carter Sand (Frozen) as Benny Alden, Gil Birmingham (Twilight) as Lonan Browning, Griffin Gluck (Middle School: The Worst Years of My Life) as Henry Alden, Stephen Stanton (Star Wars Rebels) as Capt. Daniel and Talitha Bateman (The 5th Wave) as Violet. Shout! Factory would like to offer one of my readers a copy of the three book set from the Boxcar Children world. They are Guide to Adventure, Gertrude Chandler Warner and The Boxcar Children and the novel Surprise Island, on which the film is based. This giveaway will run from April 21st to April 28th, 2018. Winner, You have 72 hours to reply. You must be 18+ Open to Canada and U.S. only Good Luck! Disclaimer - I will be receiving a three book set from the Boxcar Children world. I live in NB and would like to watch Bill and Ted's Excellent Adventure again. I'm in Alberta and would like 'Snowtime' for my grandchildren. Gravity Falls sounds like something my grandkids would like. I am in BC. one I would love to watch is.. I am from Newark, Delaware My nephew would like Gravity Falls. I am from California. I like Gravity Falls. I am in BC. I would like Gravity Tales.